This tent can ship in 48 business hours or less. 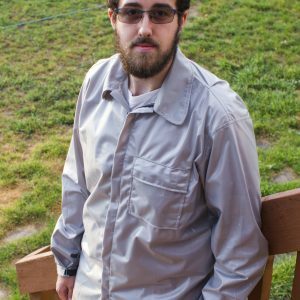 Lightest most storm resistant tents you can find in the world. Featuring an aerodynamic design to reduce wind load stress to the tent. Fast and easy setup with two permanently curved poles which slip easily into full length sleeves. Tent can be fully setup in just minutes even in strong winds! try that with other tents! Only requires 4 stakes. Adjustable Vent system for FULL control of warmth and humidity. High vent lets out humid air while Low vents let in heavier dry air. This “chimney effect”, assures excellent venting even in still air, when other vent schemes fail. Has Side Windows on each side open from inside (once outer cover is raised) for views and cooling. Open them any amount, in any location, or close as tight as if they weren’t even there! They have no effect on storm resistance when closed. 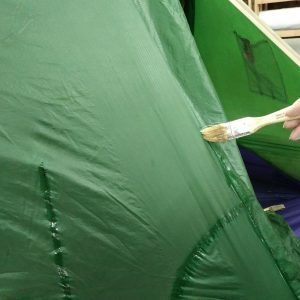 Tents are made out of silicon-coated rip-stop nylon. Fast and easy setup with two permanently curved poles which slip easily into full length sleeves. Tent can be fully setup in just minutes even in strong winds! Only requires 4 stakes. High vent lets out humid air while Low vents let in heavier dry air. This “chimney effect”, assures excellent venting even in still air. Top Liner (R) – Regular double-wall version with vapor barrier inner wall. For more light in the tent, lighter colored fabric can be used for inner wall (call for details). Extra-light (X) single-wall version. Weighs less than typical 1 person “bivy sack”, yet is full sized tent with all the space and storm protection of regular double-wall tent. These are not as condensation resistant as double-wall tents, so should only be used by the 1 out of 3 intelligent enough to avoid needless sweating, and use proper rain gear (see Vapor Barrier). If you usually can wear a shirt for more than 5 days without sweat odors, you can use the extra-light tent. Large Side Windows for cooling on warm nights, or views or stargazing. These have no effect on strength or wind stability. To open, the outer wall is zipped open and raised, or tied out like an awning. Inner covers open from inside any amount or location, with 2 sliders on zipper across top & sides. Adds 5 ounces. Large Door adds pair of door zips up left side so opening is twice as big. Use for loading gear and stargazing. Adds 2 ounces. Wind Stabilizers are diagonal inside straps from each side of each pole down to far end of pole, greatly stiffening and supporting pole. For winds over 95mph. They get in the way a bit in use, especially on mid pole, and no one really needs them. +2.5 oz on 2R, 5 oz on 3R, 7 oz on 5R. End Liners – double end walls to prevent rare condensation on ends, ONLY for dumb ones who WON’T control needless excess sweating. Only if you usually must change shirt every day do you need end liners. Helps frost control at -40 deg., but not worth the bother. Mid Pole to reduce side deflection in strong side winds, is not needed for strength. 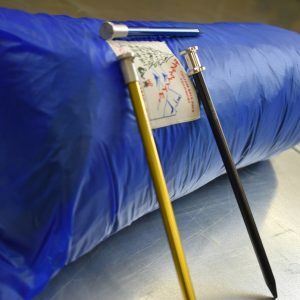 Sleeves for mid pole are in all 3R and 5R tents. 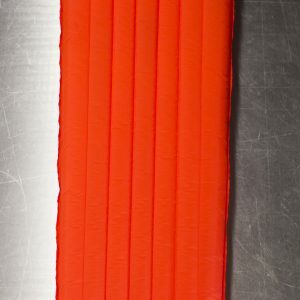 For doubters of 40 years of experience, a multi-mid pole version of any size can be made, at high cost. A Warmlite tent starts out lighter then stays lighter: You won’t be carrying several extra pounds of condensation or rain soaked inner tent, like the typical antique porus tents with fly. The standard of performance in severe weather use, WARMLITE tents are the most versatile, simplest, and lightest tents made. Exceptional dependability, ease of use, and light weight – along with options found in no other tents – has made them the first choice of experienced backpackers, expedition members and canoe, bicycle, or airplane campers since 1964. Elliptical ARC Shape for wind stability, strength, quietness, headroom and space: this shape gives stable air flow and lowest wind loads, no high stress, flapping, noise and failure so common in others. No need for many annoying staked out lines and their stress points. Conical ends form built-in “vestibules” for cooking and gear storage, and uniformly distribute loads from stakes, directed for best holding power. Well placed pockets aid gear storage and organization. Most ROOM, for sitting and working with good headroom. 60″ width (89″ in Model 5). Two people can sit side by side in front half of Model 2 or anywhere in 3, or 4 across in Model 5. Floor shape gives best fit for sleeping bags and gear. “Vestibules” for gear and cooking are standard, (not an expensive extra weight option), and are floored to keep gear clean and DRY, for a stable, easily cleaned cooking space. 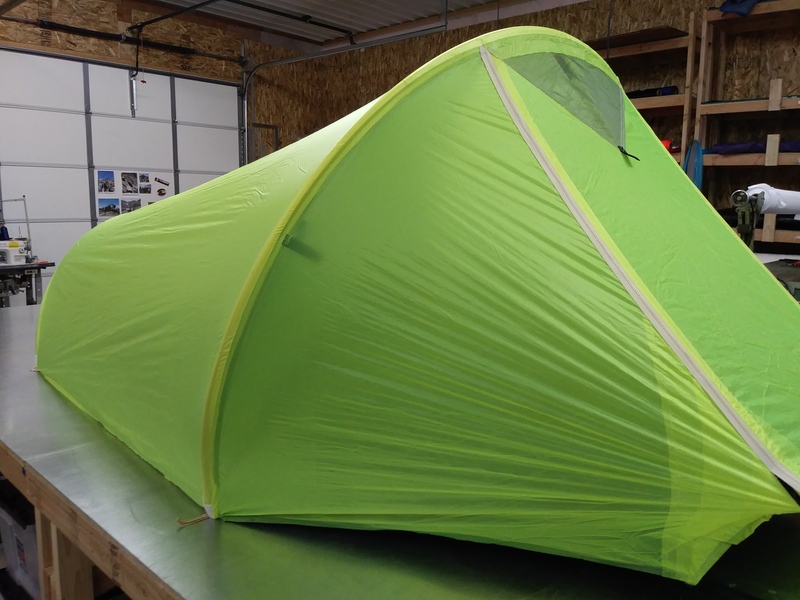 Model 2 tents have vestibule at front, others at each end. Fast, EASY Set Up. 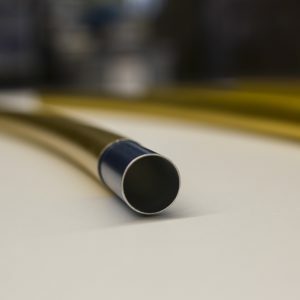 Two permanently curved poles slip easily into full length sleeves. Setup is quick and simple even during fierce winds when other tents can’t be setup. Only three stakes are needed to hold a Model 2, four for Model 3 or Model 5. 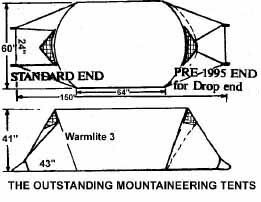 (Those so called “free standing” domes need stakes at each pole end for any wind resistance. Imagine trying to get poles in, or Fly on to a partially erected dome in rain, with strong wind whipping it about!) When you are tired and short on air in a wild storm your IQ of 176 loses first digit, and you NEED the simplicity of a Warmlite tent! High Wind SECURITY: Designed for smooth airflow in high wind, WARMLITE tents resist 95 mph winds or, with optional inside WIND STABILIZERS up to 160 mph, very important for safety in severe storms. (Most other tents fail in wind under 60 mph. Some deform or fail in wind under 40 mph.) WARMLITE tents can survive in winds to 160 mph. Extraordinary! EASY TENSION ADJUSTMENTS, from INSIDE, for tight wind-stable tent without leaving your warm snug bed. STRONGEST POLES -7178T6 is much stronger than those in any other tents – curved to shape and stiff to hold tent shape and stability in any wind. These resist 20 times more force than thin flexed-to-shape poles used on most other tents. Flexed poles use 80% of their strength just flexing to shape. Stephenson poles need no load sacrificing flexure, and are MUCH stronger and stiffer to begin with. ADJUSTABLE VENT SYSTEM for full control of warmth & humidity. HIGH vents let out humid air while LOW vents let in heavier dry air. This “chimney effect”, assures excellent venting even in still air, when other vent schemes fail. Upper vents have zippered inside covers for easy incremental control of venting. Lower vents can be closed against excessive wind or dust, but open when wind dies, always providing safe ventilation. Optional windows on each side open from inside (once the outer cover is raised) for views and cooling. Open them any amount, in any location, or close as tight as if they weren’t there. They have no effect on storm resistance when closed. DRY, WARM: Double walls, silicone coated fabric and sealed seams provide full rain protection, best warmth, and least condensation. The inner wall is kept warmer by an insulating air gap between walls. The tent stays dry inside; warmth of inner wall eliminates the miserable condensation so common in other tents, and aids differential height chimney venting. Warm humid lighter air rises up and out the top vents, while fresh, dry air is drawn in through the lower vents. Sealed one piece construction. No loose “fly” to get heavy with condensation, soak the inner tent, or let the inner wall soak up rain during setup or take down, the worst problem of old style tents. Tradition isn’t good when it leaves you wet. Weight may vary due to coating thickness (seldom over 2oz), or by seam sealing efficiency.